At the top of Sunday night’s show, host James Corden joked that the Tony Awards would be much more diverse than the Oscars—but it wasn’t just a joke. Black performers won all four musical acting categories at the Tonys for the first time in the show’s history. 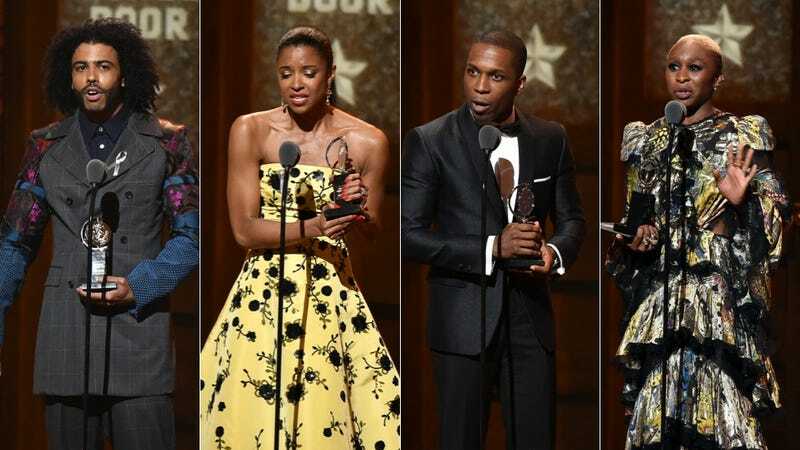 Hamilton predictably collected a slew of trophies, winning 11 of its 16 nominations, including three for its leads: Leslie Odom Jr. (best actor in a leading role in a musical), Daveed Diggs (best actor in a featured role in a musical) and Renée Elise Goldsberry (best actress in a featured role in a musical). The Color Purple’s Cynthia Erivo completed the historic night with a win for best actress in a leading role in a musical for her seriously stunning role as Celie, which viewers got a sample of last night when she blew the ceiling off with her voice (go see it live). The Tonys made note of the record wins in a tweet and yet failed to specify that all the performers are black, certainly worth mentioning. Regardless, Broadway’s tradition of being more inclusive than Hollywood, as Corden pointed out, was on display last night, led by Lin-Manuel Miranda’s masterpiece. Though not every Tony Awards is as colorful as it should be, the past year offered tons of options, between The Color Purple and Eclipsed and On Your Feet! and Shuffle Along, or, the Making of the Musical Sensation of 1921 and All That Followed. In another deeper-than-rap moment, Hamilton’s Goldsberry mentioned her struggle to have kids. “I’ve spent the last 10 years of my life, what some would consider the lifeblood of a woman’s career, just trying to have children,” she said. Erivo, who won for her Broadway debut in The Color Purple, also had a tearful acceptance where she thanked Oprah and “Alice Walker for writing a story that could last through time and time again.” Watch them all below.